The image below illustrates an error observed on some hardware platforms that fail to PXE boot FreeBSD’s bootonly ISO under UEFI. The failure occurs in mountroot() and manifests as an error 19 reportedly meaning the media cannot be located. This has been observed with 10.3, 11.1, and 11.2. One can workaround this problem by deploying a bootonly ISO configured with an MFS_IMAGE. EFI_STAGING_SIZE may need adjusting to accommodate larger objects; It defaults to 64. EFI_STAGING_SIZE can be defined within make.conf, release.conf, or on the command line. While not illustrated below, EFI_STAGING_SIZE is implicitly defined specifying a make.conf that includes the knob in the environment via MAKE_CONF. MFS_IMAGE is necessary because the project’s bootonly ISO fails to PXE boot at mountroot() w/ error 19 indicating the boot media cannot be located. MFS_IMAGE implies a MD_ROOT root filesystem. The build system doesn’t seem to provide a mechanism to build a default MFS_IMAGE and is therefore done outside the context of a build. The following procedure builds a binary distribution from the source tree in it’s default form (including the default bootonly.iso). It rebuilds the bootonly.iso after generating a root partition and MDROOT kernel. A security embargo is an agreement between parties, typically a vendor and interested parties. The interested parties are generally individual(s) or organization(s) that discovered a security vulnerability in a vendor product. Security embargoes are not limited to two parties and may include multiple vendors and/or other stakeholders. Parties to an embargo generally agree to withhold disclosure of a security vulnerability until a mutually agreed upon date, which is often a date the vendor will publish patches. Security embargoes primarily provide vendors time to research and patch vulnerabilities prior to public disclosure and limit the risk a malactor may exploit such a vulnerability before patches are available. In February 2017, Mitre assigned CVEs to Intel for each of the vulnerabilities we now know as Meltdown and Spectre, CVE-2017-5715, 2017-5723, and 2017-5754. There exists ambiguity in the timeline of events surrounding disclosures. For example, The Guardian indicated Google disclosures were made to Intel in June and July 2017 while The Verge indicated December 2017. What is known as fact, however, is that the public was generally unaware until Google’s announcement on January 3, 2018, almost a week prior to the agreed upon disclosure date of January 9. In fact, Intel’s disclosure of Meltdown-Spectre is coming under increasing scrutiny after The Wall Street Journal on January 28 reported that Intel had made disclosures to Chinese organizations prior to notifying US authorities. Also known is that Alex Ionescu publicly posted about a Microsoft work-in-progress that is suggestive that Microsoft and some Linux related project(s) were aware of the vulnerabilities in November 2017 and likely before. Meanwhile, researchers were beginning to investigate — and ultimately exploited — these vulnerabilities disclosing them to Intel over a period of months. It follows that organizations who disclosed their findings to Intel likely became party to a security embargo at that time. While the timeline is debatable, it’s suggestive that work to mitigate these vulnerabilities was in high gear as early (likely earlier) as September 2017 particularly with Microsoft and some Linux contingent, as alluded to earlier. Despite the lack of clarity surrounding the disclosures, it is a fact that the FreeBSD project was not aware until late December 2017 while other BSD projects received no advance notice. This should have been disclosed to the BSD operating systems at the same time it was disclosed to Microsoft and Linux. Why? BSD is ubiquitous among many network and systems devices forming a foundation upon which Internet infrastructure is built. The failure to notify these projects has put undue risk on various pieces of the Internet. When Meltdown-Spectre were finally disclosed, Microsoft and Linux were better prepared to deploy OS patches. After all, they had been working for months on the problem. Conversely, the BSD operating systems had only a week to prepare and are still catching up on patch integrations. Intel has even been ill prepared as they released microcode that was subsequently recalled then followed up with another release recently patching Spectre Variant 2 (CVE-2017-5715) at time of writing. Consequently, organizations likely continue to remain vulnerable. This brings attention to the problems the community faces as it becomes increasingly obvious security embargoes do not scale to accommodate all possible stakeholders. There are no clear rules beyond an unenforceable agreement to disclose vulnerabilities, which fosters an environment where only some stakeholders are informed of newly discovered vulnerabilities. In conclusion, there must be continuing discussions about these problems and their potential solutions. Failing to encourage continuing discussions will only maintain the status quo. I have been a UNIX engineer for more than 20 years. Still, my experience is not generally within the security realm. 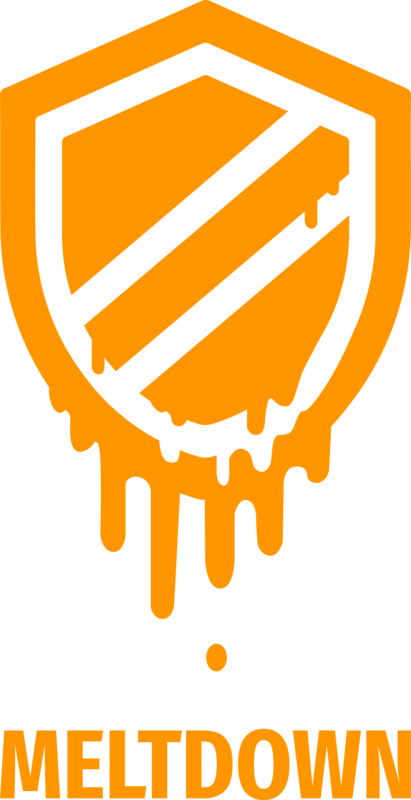 This post describes a personal interpretation of problems regarding security embargoes particularly surrounding Meltdown-Spectre. Both attached to the same router on the same network, the Intel wirelessly and the Insignia via USB-to-Ethernet. Networking on the AC-8265 wireless only worked when attached as NAT. The Insignia worked as a bridged network. The platform’s hardware virtualization was, oddly, disabled. 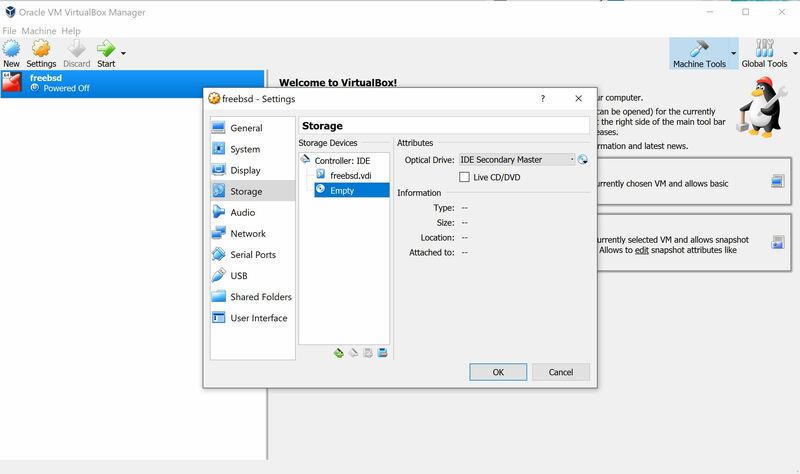 Without the hardware virtualization, VirtualBox would not support 64-bit guests, only 32-bit guests. So, I enabled it. This is an overview of the process. During my initial exercise, “Enable hardware virtualization” did not happen until it was discovered disabled. The primary scope of this post is to describe the overall tasks necessary to install FreeBSD as a guest and enable networking. 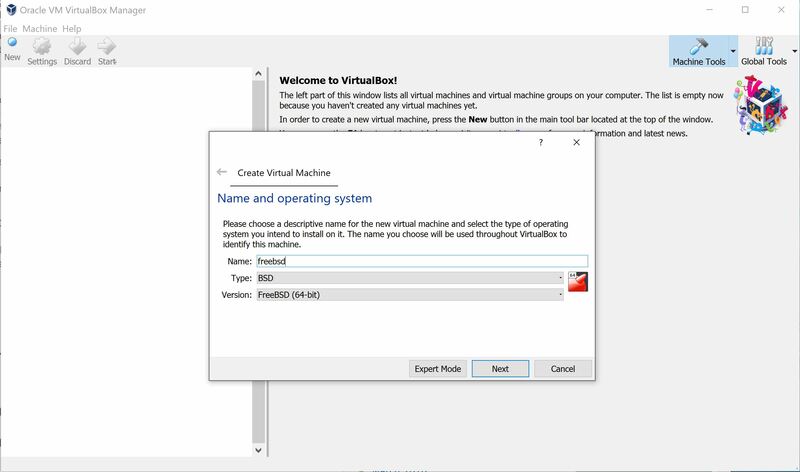 It starts at creating a VM in VirtualBox. Also described will be challenges regarding networking the FreeBSD guest over a wireless bridge. Typing “freebsd” in the name field automatically changes the others. Finally, click “Next”. In the following screens, set the memory, disk size, and other disk properties. The values here are mostly irrelevant, but for this exercise 4096MB RAM and 16GB disk were created accepting defaults for all other disk properties. 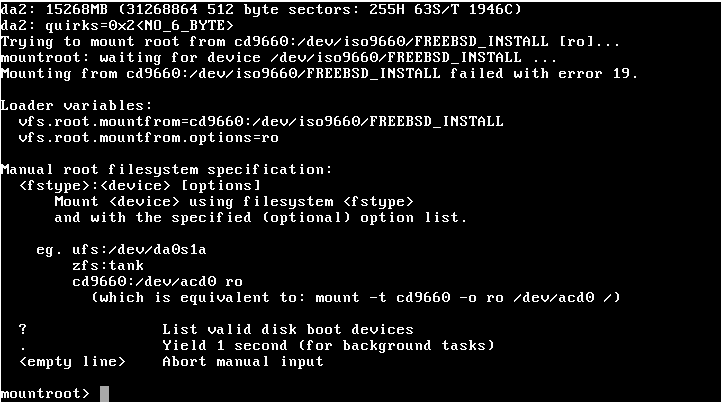 FreeBSD gets installed via an ISO previously downloaded and staged. The disc1 ISO was chosen for this exercise because it contains the FreeBSD distribution files. 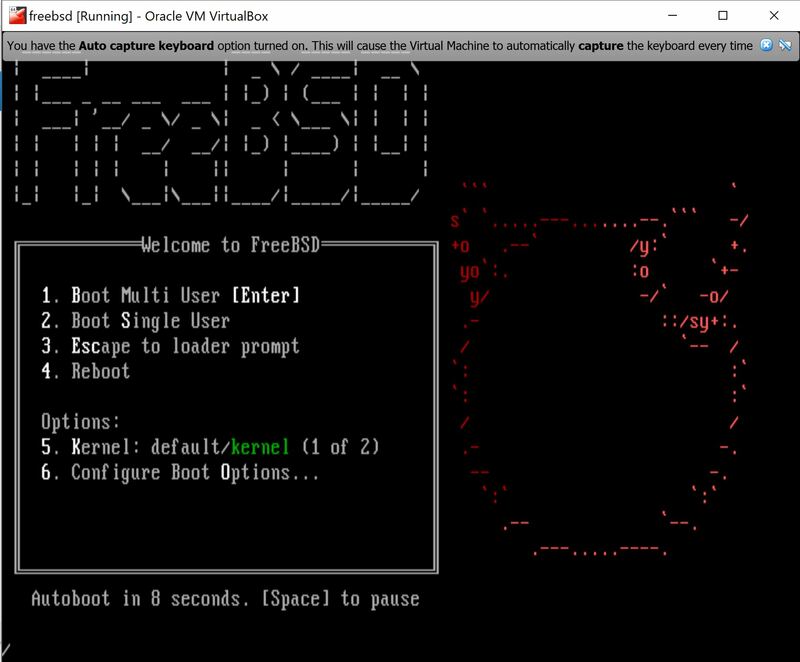 First, from the main VirtualBox windows, select the “freebsd” virtual that was just created and click “Settings” on the menu above. Select “Storage” then the “Empty” optical device. Next to the optical drive, click the optical media icon to open a Explorer window. Locate the ISO on the local storage, select it, and click “Ok”. Perform a normal start on the virtual machine and it will boot to the optical drive, the FreeBSD installation media like below. The interactive installation now starts. Proceed through the installation as you normally would and install the operating system. Observe the results below. 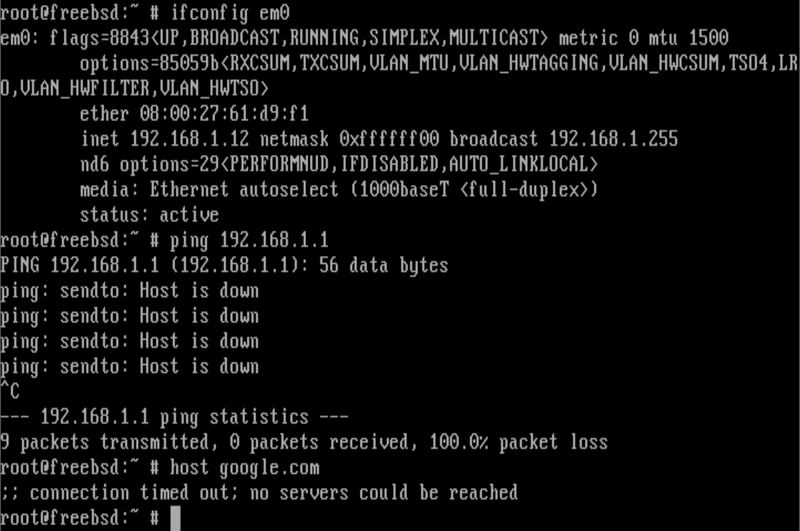 Note em0 receives its IP address, but networking doesn’t seem to work as illustrated by the “Host is down” message when the defaultrouter is pinged. Additionally, host(1) fails to return the desired result…successful lookups. Observe the results below. In direct contrast to those above. em0 is assigned an unknown IP address, but the defaulrouter responds to ping and lookups. Network is working at some level. Observe the behavior below. 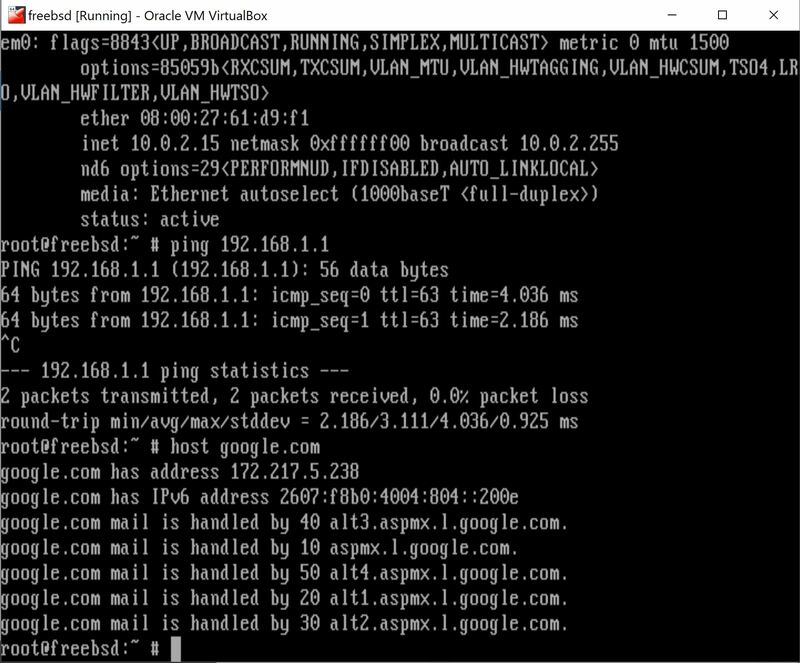 em0 DHCP’d its IP address, was able to ping the defaultrouter, and performed a host lookup. Network via bridged network functioned as desired. 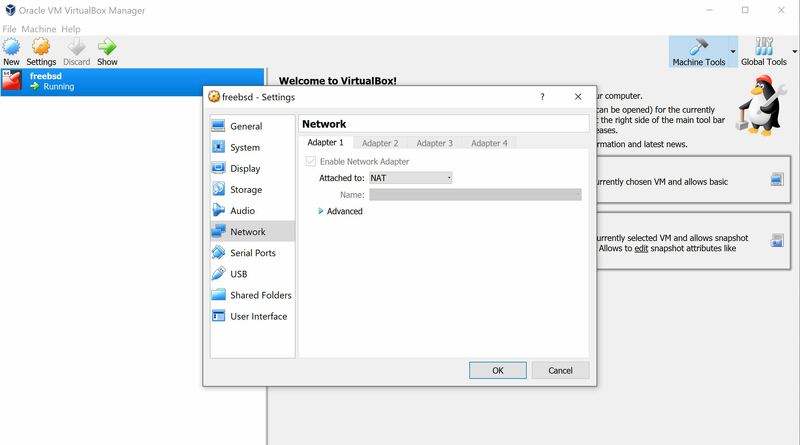 The reference URL below identifies at a high level the tasks that need to take place to enable guest networking in VirtualBox. It also states “Some wireless adapters don’t work”, which becomes the reason for not digging deeper into why the wireless adapters doesn’t work here. 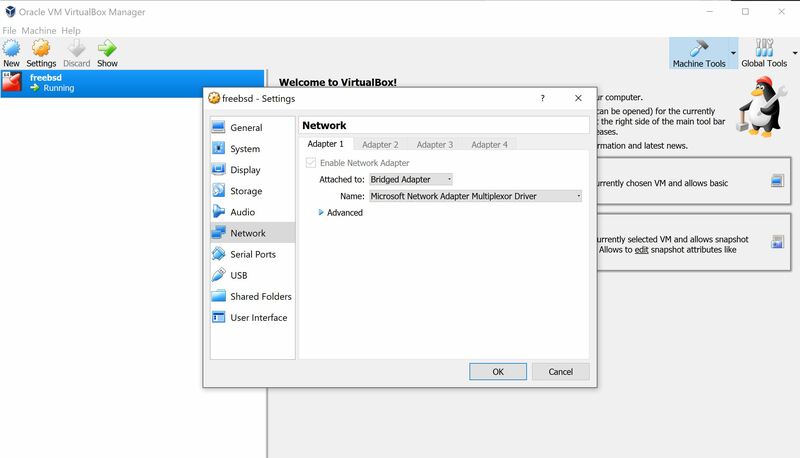 Instead, it becomes recommended to enable VirtualBox guest networking via a wired network bridge. The rollback of the not yet effective USA FCC regulations enacted during the Obama administration poses an interesting dilemma. With the regulations set to take effect in 2017, user’s were/are still subject to whatever unregulated behavior an ISP chooses to exercise. In essence, all internet users are vulnerable to the whims of their ISP. Therefore, the rollback of these regulations does not materially impact Internet user behavior or activity at present. These FCC regulations would have enabled users to trust that their ISPs, at least to a certain degree, are complying with privacy regulations and keeping much of the data generated by user’s activity private. While this may be an onerous assumption to make, the regulations allay fears of nefarious behavior by ISPs with user’s data. Coupled with Vault 7 revelations and the FCC regulation rollback, many are concerned about their internet privacy and are clamoring for an answer. Predictably, paid VPN services are being discussed as a means to prevent snooping by user’s ISPs. This is an effective countermeasure achieving that specific goal, but is only a single tool out of many that should be deployed in parallel to minimize one’s exposure. Deploying VPN services carries with it it’s own set of complications and considerations. Chief among these is trust as one is essentially changing the trust relationship with their ISP in favor of an another entity further along the line, but are prospective VPN services worthy of this? VPN providers have unfettered access to any traffic traversing their network. Additionally, they — and incidentally you — may be subject to laws and regulations of the prevailing authorities/jurisdiction, which may or may not be friendly to the end goal. Even if hosted outside the borders of the US, these services are subject to higher authorities. Can they be trusted? The answer is not clear and concise as it depends largely on the user’s desires. The next logical leap is to consider self-hosting and operating one’s own VPN endpoint. This removes trust from all providers placing it with the user. The user controls the VPN, its configuration, and operation regardless of the jurisdiction within which it may be deployed. The user can control user registration and records, logging operations and scope, and log retention policies [generally within the constraints of the prevailing jurisdiction]. Even if one chooses to self host a VPN service — particularly within the US — consider the service on which the VPN is deployed may potentially be legally defined as an ISP. After all, they do provide a service on the Internet and can conceivably engage in the same behavior that is feared ISPs such as Verizon or Comcast will engage in. This invalidates the trust relationship with a broader definition of an ISP and/or common carrier. Obviously, the landscape changes with varying jurisdictions, whether US-based or international. This post describes disk I/O performance capabilities of the HP DL360p G8 in terms of filesystem journaling mechanisms on FreeBSD 10.3. All internal drives comprise a single RAID6 configuration with two logical volumes exposed to the OS. da0 is a 100GB volume while da1 is comprised of the remaining available disk space. da0 is reserved for the OS and user-land. These experiments are executed on an empty da1 of approximately 2T in size. Testing of the I/O subsystem was performed utilizing iozone for an application independent perspective. In the interest of minimizing the amount of time necessary to execute these experiments, we minimized the number of test cases to remove those of less value given the assumptions. There were two primary tests; Writing of a 256GB file in conjunction with iozone’s -e and -o command-line options which causes each write to occur asynchronously w/ a full flush to disk. This is intended to be a worst-case scenario eliminating as much cache/buffer benefits and forcing I/O to be fully absorbed by the disks and disk controller. Secondly, testing was completed on a 75MB file while not utilizing the -e or -o options to iozone. This is intended to provide a best case scenario where the effects of OS level caching and buffering are realized. A record size of 4096k was used as independent tests by a colleague showed this size providing the best performance. In the various different configurations, a different size may have provided better results, but they were not tested in an effort to minimize the number of test scenarios. The tests were executed in a series of 3 samples averaging the results across all samples. It is February 2018 and almost 2 years have passed since this post was originally published. It has become this blog’s most popular post. Hopefully it has been insightful and useful to those who have read it. Since the initial phases of this project, there have been some new experiences and lessons learned. Therefore, I thought it was a good idea to update this post integrating those experiences. The updated post also integrates solutions to the problem described in the first comment. Please enjoy! This post is best viewed within a desktop environment due to the expression of config files containing lines longer than smaller displays. Therefore, it is not particularly well suited for mobile browsing though reader view may alleviate some formatting issues. One of my more recent projects was to integrate FreeBSD into a Kerberos-secured authentication and authorization system based on the FreeIPA architecture. This post is an aggregate HOWTO with information sourced from a couple public (and one private) websites and a mailing list in addition to my own personal experience. The architecture and infrastructure of the FreeIPA system are beyond the scope of this post and will not be covered here. The focus is installing and configuring a client to use the FreeIPA-based authentication and authorization system. Failure to meet requirements 1-3 generally introduces latency from the perspective of the client particularly when logging in remotely with ssh for example. NTP should also be configured and running. The break-glass account is a local, UNIX-based account on the client filtered via SSSD policy/config. It will not use SSSD for authentication and it can be arbitrary in nature, so long as it is filtered. This is useful when remote access is lost due to service outage or similar. It is also useful to open a session to this user while this process is executed. Client services won’t start and the client will fail authenticate and authorization against FreeIPA infrastructure without the proper software installed. Custom options are required to support FreeIPA. This can be done via Ports or packages; Described below is the latter. Finally, the host keytab file must be generated in the FreeIPA infrastructure and securely copied to the client. The keytab facilitates system authentication via Kerberos. The goal is to integrate FreeBSD into the FreeIPA architecture to provide services to ssh and sudo. No other authentication or authorization mechanisms were tested. Additionally, this post is constructed from notes and memory. Hopefully nothing has been missed and everything is accurate, but it is possible this is not the case. Help me keep this accurate, if necessary. There are two high level tasks to be completed; Generate the binary package repository with FreeIPA-enabled packages and client installation/configuration. The binary package repository only needs to be done once. Ongoing maintenance of binary repositories is necessary to make newer versions available when necessary. Execute this process to build a binary package repository containing the necessary packages w/ custom options enabled. It is assumed a pre-existing Poudriere build and distribution environment is available. The kerberos implementation deployed in IPA dictates the kerberos implementation software is built to support. MIT kerberos is the predominant implementation in use within the US. The above configuration supports MIT kerberos. KERB_GSSAPI can cause the openssh-portable port to be marked as BROKEN because it’s dependent on an unmaintained patch, which has been updated occasionally by the Debian project. This generally appears to be the case when the port is updated to a newer version. FreeIPA includes a client installer for Linux that is unavailable for FreeBSD. Rumors suggest porting it to FreeBSD is non-trivial. It was not done for this project. It would simplify this process significantly however. The procedure below includes commands executed on the command line as well as descriptions of operations needed to be completed such as editing or creating a file. Several commands and/or files include hostnames inherently describing a dependency on DNS. Open a standby shell in order to maintain access to the system during this operation as access to the system can be halted in executing it. $cblrserver is the hostname or IP of the server from which to grab content. This is simply an HTTP accessible resource. chpass_provider is irrelevant to FreeBSD because the IPA tools are required and currently unavailable to FreeBSD. This service can be provided to users on separate infrastructure using Linux instead. Also note filter_users includes root in addition to the break-glass account. NSS interrogates the data source in the order in which it’s listed. The above policy first validates authentication/authorization for local UNIX accounts before SSSD. NSS validates via SSSD when the invoking user is not a local UNIX user. It may be desirable to symlink /etc/pam.d/sudo to /etc/pam.d/system or /etc/pam.d/su depending on the desired behavior. 9) Create /etc/netgroup with the following script. Set this script to run via cron to rebuild the file periodically. This script is ported from one of the references to update /etc/netgroup locally on FreeBSD hosts. LDAPSRV is the hostname or IP of the LDAP server to query. This is generally the same as the IPA servers. Executing this script via cron will keep the file updated. Note the patch below may be useful if /etc/netgroup tends to be large file. If LDAP returns netgroups in response to a query, sudo calls innetgr(), which subsequently loads and iterates the file to determine if the host belongs to a netgroup in which the invoking user is a member. NSS’ netgroup database provides the data source for innetgr() which supports neither sss nor ldap. The time required to iterate the file is proportional to it’s size and can introduce severe performance degradation. The patch below — when applied to the script — ensures only relevant entries exist thus reducing the file’s size. The patch assumes the script is called mknetgroup.sh. FreeBSD PR 226119 is open as a feature request to implement a LDAP data source for NSS’ netgroup database. # Construct a netgroup file from LDAP hostgroup definitions. # data through LDAP or sssd backends (lacking nsswitch/nsdb support). # new line between records; this means a record ended. # output netgroup line if we have members. Upon completion, the target host has been configured to communicate with the authentication and authorization frameworks. Reboot is not required, but certainly recommended. The program is being expanded in 2015 to colocate a FreeBSD Developer’s Summit the day preceding main conference activities. Additionally, space will be allotted for use of Hacker Lounges and Doc Sprints. These self-moderated sessions are open time during the off hours of the conference for use by members of all the BSD communities to collaborate and work on varying projects. The inaugural vBSDcon was a resounding success and included speakers from the FreeBSD and OpenBSD communities. It also featured prestigious sponsors including The FreeBSD Foundation, who is returning as a Developer Summit sponsor in 2015, RootBSD, Daemon Security, iXsystems, HP, Juniper, and CDW.